It's been a while for some sheet masks review. 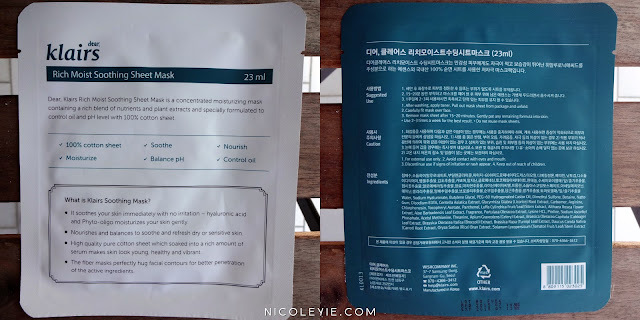 Recently I have been trying out the Klairs Rich Moist Soothing Sheet Masks from Natta Cosme and I'll be sharing my thoughts about this sheet mask here today. In case you haven't heard of the brand Klairs, it's a Korean brand that was created to solve sensitive and intolerable skin problems. One of their best selling product is the Illuminating Supple Blemish BB Cream! I'm glad that I have another opportunity to try out their product once again cause of the brand mission, and besides, this sheet mask is currently their best moisturizing face mask. So without further ado, let's hop onto my review now! The sweet packaging from Natta Cosme with 10 pieces of the Klairs Masks. Dear, Klairs Rich Moist Soothing Sheet Mask is a concentrated moisturizing mask containing a rich blend of nutrients and plant extracts and specially formulated to control oil and pH level with 100% cotton sheet. What's so special about this mask? 1. Lessen stimulus and increased absorption with 100% pure cotton. By using pure cotton mask sheet, it's lessen stimulus and maximized grip between face and the mask sheet. Within the mask sheet, it contains high concentration of moist to refresh your skin. 2. No stickiness, clean finish. With hypo-allerginic ingredient, moist sheet mask offers excellent absorption and no stickiness after use. Also, you will experience complete difference of your skin after use. Hyaluronate, the main ingredient for moisturizing and calming, not only does it provides long lasting hydration but also helps calm your sensitive and troubled skin. Root of a hollyhock and phyto Oligo, extracted from aloe, and other healthy plant ingredients for your skin are used to provide you with the best nourishment and outstanding hydration. The mask's packaging has a matte surface, and I'm loving the whole look! After cleanser and toner, pull out the mask sheet from the package and unfold. Carefully fit the mask over the face. It's recommended to use it 2-3 times a week. Mask sheets are not reusable. You can use the excess liquid from the mask or in the package on your face, neck or hands if you want. The mask contains half a bottle their Rich Moisturizing Essence, full enough to stick and fit properly on my skin. I'm loving the cotton texture of the mask cause it does fits well onto my skin without moving easily, except it will become too big for me if I accidentally used too much force to unfold it which will change its shape (cause it's cotton, duh). Nope, it's still sticky after using it, just like most of other sheet masks. But it's hypo-allergenic, suitable for sensitive skin people, so I don't really mind about that. 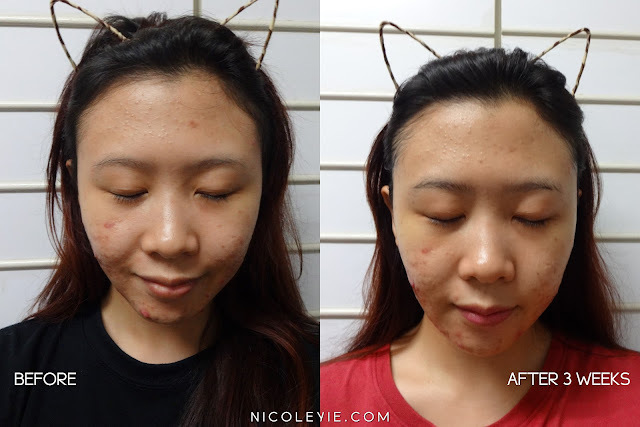 My skin before start using the mask and after finishing the 10 pieces after 3 weeks. As you can tell from the image above, my skin looks more nourished and brightened after using it. There are new pimples popping out during the 3 weeks, but don't blame the mask because I never expect sheet masks will cure my acne or pimples, it's mostly my health problem. At least some old pimples are gone, and some scars are faded away, and my skin remains hydrated from the sheet mask. But for oil controlling, it doesn't really help me to control oil as my oily skin still keep secreting excess oil for the past 3 weeks, which might be the reason of my new pimples. In overall, the mask is great for hydrating. I hope all the features that didn't work on me does work on anyone else. Do give it a try if you doubt about my review cause different person has different type of skin, especially for dry skin people. First time I tried this, the mask feels so hot in my face. After few minutes, it's gone. I wonder whether you feel the same?